In legend, returning from the mountaintop can be a letdown, but, for me, settling back into home in these Texas hills after traveling in the mountains of Colorado feels comfortable, like replacing regular street shoes with cuddly slippers. There are just as many wonders close to home as there are far afield. One of my neighbors, who has traveled extensively throughout the world, makes a practice of photographing plants, birds, butterflies, and other insects and animals found within fifty feet of his home. His work is beautifully executed and reveals the richness of life carrying on around us. For me, traveling provides new eyes upon returning home. Familiar sights appear new. 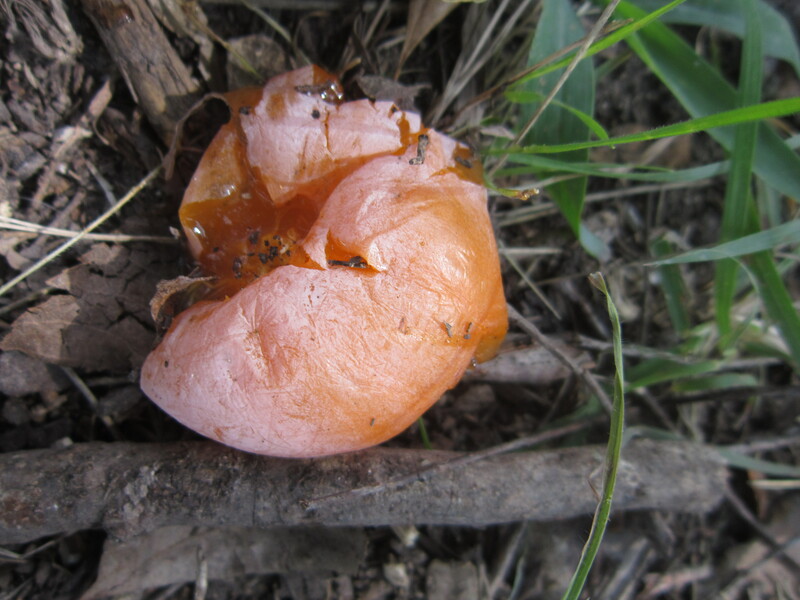 This week, as I walked a path along the creek which I have traveled hundreds of times, I almost stepped on a small fruit lying on the ground. I didn’t recognze it, so I looked around for its source and, tucked among the bald cypresses, found a 50 foot tall tree I had never noticed. 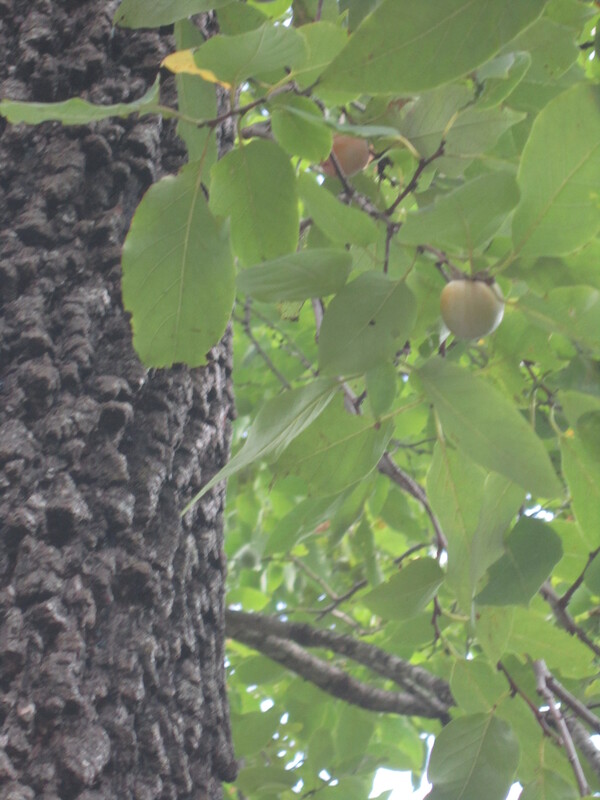 It seems to be a common persimmon, not usually seen in our area. Perhaps it was planted by the German settlers here in the late 1800’s, the ones who built the rock fence which I so love. 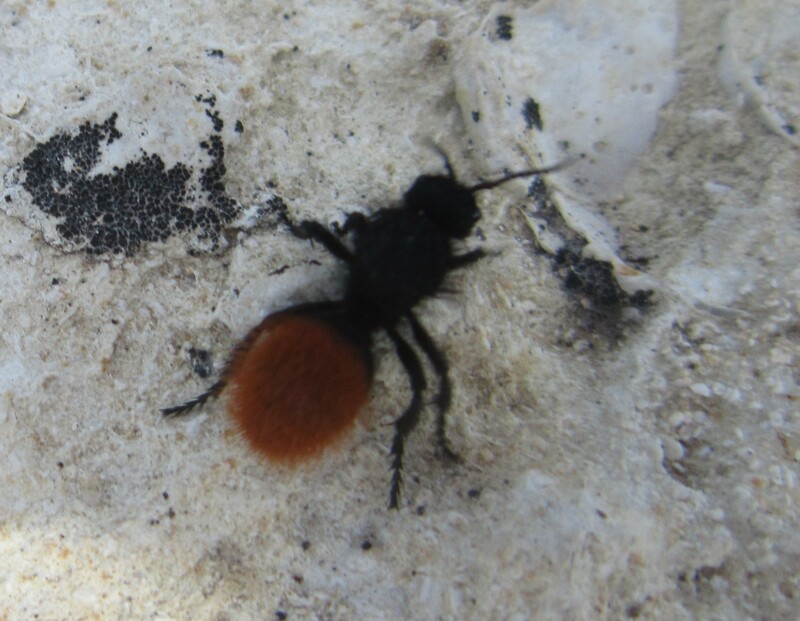 On the same walk, I chased a quick-moving velvet ant with my camera, an insect I had never previously bothered to identify or photograph. And each early morning since our return from Colorado, I’ve smiled to hear the wild turkeys chattering and fussing as they strut around behind the house. What a gift it is to notice everyday secret glories with other eyes and other ears. What would you notice if you had to take fifty photographs today within fifty feet of your house? What benefits do you find from travel? This entry was posted in awareness, gratitude, happiness, landscape, ordinary miracles, secret glories, Texas hill country, thankfulness, trees. Bookmark the permalink. What a lovely description: “flying tigers”. Bees often cover my lavender plants, and I love to watch them closely. They’re intent on loading themselves with pollen. Thank you, Linda. Thanks for the reminder, Chris, of seeing things with new eyes…this week in Kerrville there have been many of Kerr Arts Cultural Center’s “Quick Draw” artists from around the country in town on street corners with their easels painting scenes we local often take for granted. It’s been delightful! We should take some time to be tourists in our own towns, I think. There are several historical buildings and attractions which I’ve never visited though I’ve lived here for more than 25 years! Time to open my eyes . . . Thank you, dear Anne, for your insights and ongoing support. Ma’am, this is an interesting topic for me- and one that in my current circumstance I think of daily. After my last deployment to Iraq, I found myself noticing more of my surroundings. I remember driving in traffic after stepping off of the bus from the deployment and just enjoying the seats of my vehicle. After a long day at work, I would roll the windows down and drive the backroads home in the dark just to smell hay that had been cut- but remembering that the first time I saw grass after 9 months in the desert, I was in awe at the color green. The return from Afghanistan will be different, but I am sure that I will be struck at the color of my roses and the quiet of my house. I know there will be other details that will come as a surprise- grocery shopping, going to church, talking to a friend face to face, riding my horse, that I will learn to appreciate again. Carisa, this is a moving reminder of the daily ordinary miracles that we take for granted–and that our troops give up. I will look forward to your return from Afghanistan and to a description of what you then notice with new eyes. In the meantime, may I just say that YOU ROCK! I am proud to know you.